FRASER features materials that provide context for understanding Federal Reserve policy decisions, including Federal Open Market Committee Meeting minutes, transcripts, and other documents; the Federal Reserve Bulletin; and Annual Reports of the Board of Governors. FRASER also offers complete collections of the public statements and speeches of members of the Board of Governors and District Bank presidents. In 2004, Christina and David Romer identified another source of information about Federal Reserve policy: nomination hearings for Federal Reserve Chair. In “Choosing the Federal Reserve Chair: Lessons from History,” they argue that the Fed’s policies reflect “policymakers’ views on how the economy works and what monetary policy can accomplish.” Romer and Romer examine the testimony given by nominees for an indication of his or her economic framework. Romer and Romer cite G. William Miller’s 1978 testimony advocating nonmonetary approaches to solving inflation—“The best chance for dampening down inflation is in an area where the Fed does not have direct control”—and contrast that with Paul A. Volcker’s 1979 testimony regarding inflation—“I don’t think we have any substitute for seeking an answer to our problems in the context of monetary discipline.” These two Chairs understood the causes of inflation and solutions for dealing with it very differently, and the Romers’ article shows that their differing views were revealed in their nomination hearings. Romer and Romer describe many different sources of information for understanding an incoming Chair’s policy beliefs. FRASER offers all the documents cited by Romer and Romer: the nominees’ own speeches, writings, and testimony. 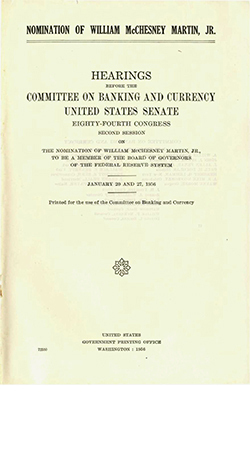 FRASER contains transcripts of nomination hearings back to 1931, starting with the nomination of Eugene Meyer to the Federal Reserve Board, through the nomination hearing of Janet Yellen in 2013.